From circles to intentions; from decisions to reactions - and now to divisions. There are many clashes throughout this episode. Clashes of culture, clashes of belief and clashes of will all combine to bring an emotional hour to the screen. As the episode opens, Claire and Adawehi are sitting by the river washing plants and herbs, while they teach each other their respective languages, each learning the words for rabbit, mother and tea, as Adawehi provides Claire with herbs for an expectant mother. She asks Claire via gestures if Claire has any children. Claire answers that she has a daughter who lives far away, but Adawehi looks puzzled. 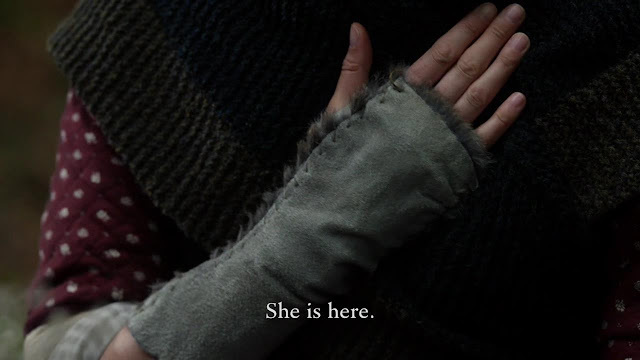 “She is here,” she says. While we know from the ending of the previous episode that this is likely to be true, Claire interprets the meaning to be that Brianna is always “here” in her heart. Back at the now fully built cabin, (and what a cabin it is!) 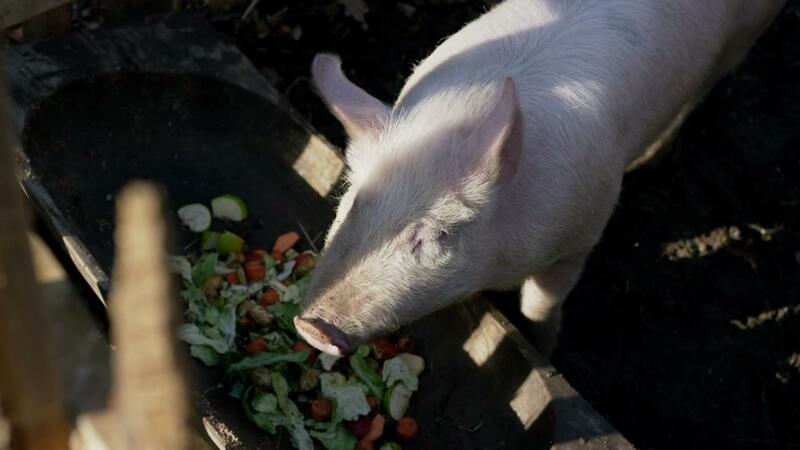 book viewers are given their first glimpse of the infamous white sow. Inside, Claire and Jamie are the picture of domesticity: Jamie looking for his hat, Claire packing her medical bag and asking her husband to pass her the last of the jerky from the jar on the shelf. This is a gentle, relaxed scene and it is nice to see Claire and Jamie occupied with relatively normal household chores for a change! Jamie is preparing to go into Woollams Creek to try and find new tenants for the land, while Claire is heading to the Mueller family cabin to help deliver a baby. Jamie comments on who has the hardest task ahead of them, saying that Mrs Mueller’s cooking not withstanding, Gerhard Mueller is as stubborn as their mule, Clarence! 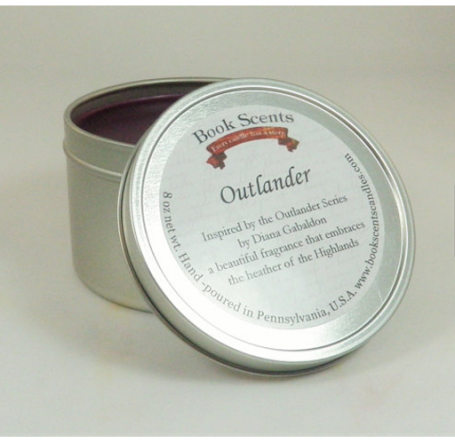 While Claire is busy gathering the last of her supplies, Jamie takes one of the silver candlesticks that Jocasta gave him and places it into his saddlebag. Ian comes in with Jamie’s hat, having rescued it from the sow. He is in good spirits and anxious to be away on the trip. He goes to help himself to more jerky before being quickly dispatched outside with Claire’s medical kit. Jamie asks Claire if she wants him to return, in case the child comes sooner than expected and leaves her in the cabin alone. But Claire reassures him: she has been alone in the cabin before, she says. Jamie knows this, but comments that it doesn’t make it any easier leaving her. Tenderly, he helps her into her wrap. When she turns around, it is obvious that he has something on his mind. Haltingly, Jamie asks Claire if Brianna has a birthmark on her neck. Claire confirms that she does, but remarks that she doesn’t remember telling Jamie about it. With a look of wonder on his face, Jamie replies that he saw it in a dream the previous evening. He proceeds to describe both the shape and location of the mark - a small brown diamond behind her left ear, much to Claire’s teary amazement. She hasn’t thought of the mark in years, as it is usually hidden. “Behind her hair”, Jamie says, finishing the sentence along with her. Jamie tells Claire that he kissed Brianna there in his dream. Claire holds him in return - it is a lovely tender moment between the two. 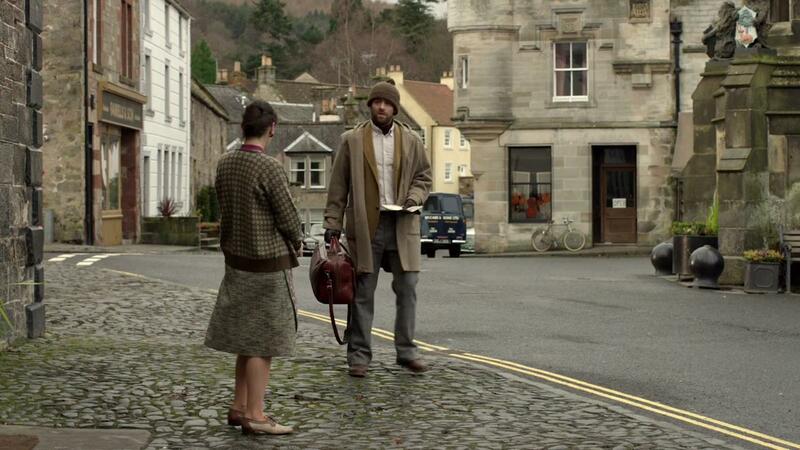 In 1971, Roger has come to Inverness, searching for news of Brianna. At the taxi booking office, the manager confirms a one way fare to Craigh na Dun 10 days earlier. Roger asks where Brianna was collected from and is told it was from Baird’s Bed and Breakfast. This is the same hotel where Claire and Frank stayed, but it is now being run by a Miss Baird, presumably the original owner’s daughter. Roger shows the woman the sketch of Brianna, and Miss Baird recognises her immediately as the young American, commenting on a resemblance to actress Ali McGraw. Roger asks how long Brianna stayed and is told that it was just for a few days. When asked if Brianna left anything behind, such as clothes or books, Miss Baird says that nothing was, but she stammers over her answer. The question has rattled her for some reason. Roger thanks her, saying that he was hoping he would find something and walks away. But Miss Baird calls after him. She goes inside to fetch something, returning with a letter. Miss Baird tells Roger that Brianna had asked her to wait a year before sending him the letter, but she takes pity on him. It is obvious, she says, that Brianna has broken Roger’s heart. Being the fine looking lad he is, he should go and find himself a good Scottish lass. “Yes, perhaps I should,” Roger replies, disconsolately. 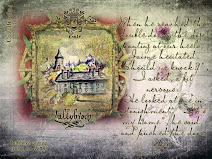 He bids Miss Baird farewell, and walks off, the letter clutched in his hand. Jamie and Ian have arrived in Woolams Creek. They are confident. Myers has told them of at least a dozen Scottish families and the offer of 100 acres is likely to attract a fair number of tenants. Jamie passes out flyers that advertise the deal, as Ian muses on how nice it will be to have neighbours again. Jamie longs for a decent chess opponent, while Ian is more concerned to find families who have daughters to woo. The two split up: Ian to distribute more pamphlets and invite interested people to a meeting the following day, Jamie in search of MacNeill, the silversmith. 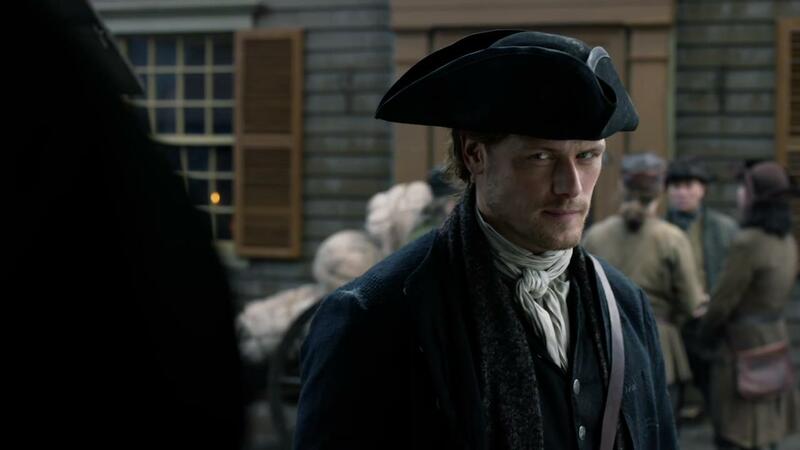 Instead, Jamie finds MacNeill’s flirtatious wife, the silversmith being away. She is keen on inviting Jamie inside, but he deflects her offer, asking if there is anyone else who knows the silversmithing trade. There is something particular he wants made, he says, and we can hazard a good guess as to what this is. 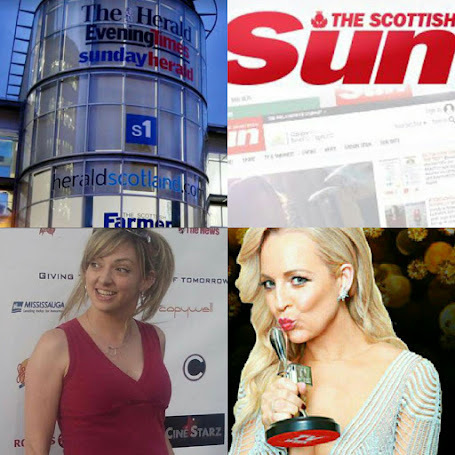 Mrs MacNeill replies that there is no one with her husband’s talents, Jamie thanks her for her time and walks off. Meanwhile, Claire is at the Mueller’s cabin. The birth has gone well and the women are singing softly in German to the baby girl, remarking how much she looks like her dead papa. Claire smiles a little sadly, obviously thinking back to the first time she saw Brianna and saw the resemblance to Jamie. Almost as if she can read Claire’s mind, Frau Mueller asks if Claire has any grandchildren. “Not yet,” Claire replies, prompting Frau Mueller to declare that Claire will share hers. 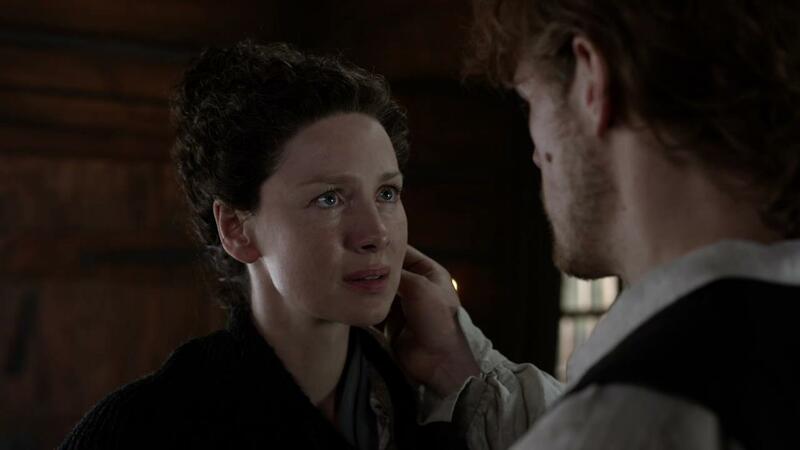 Claire is incredibly touched by the gesture and the women clasp hands. 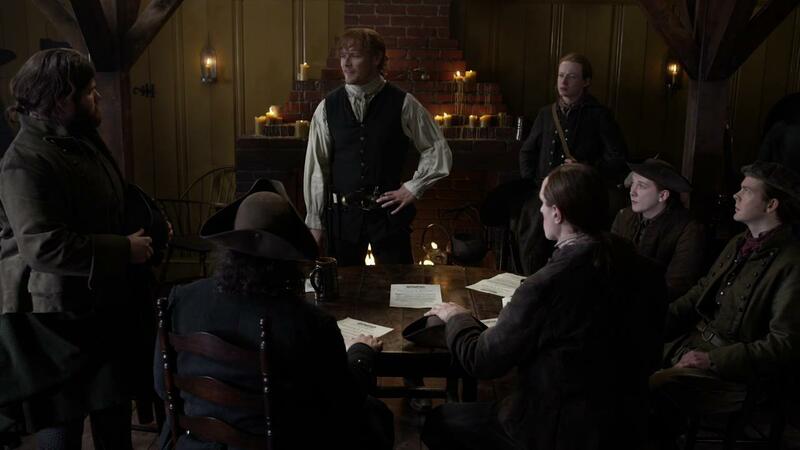 In the tavern, Jamie is meeting with prospective tenants. Any man who settles with him, he says, will receive 100 acres, with no rent to be paid until after the first harvest. Furthermore, taxes will be capped at 1 half penny per acre per annum. It is obvious that Jamie expects the men to sign up immediately. Instead, they begin to refuse him. Jamie is confused: “Do you not want 100 acres for yourself and your family?” he asks. Following this man’s lead, the others get up to go. 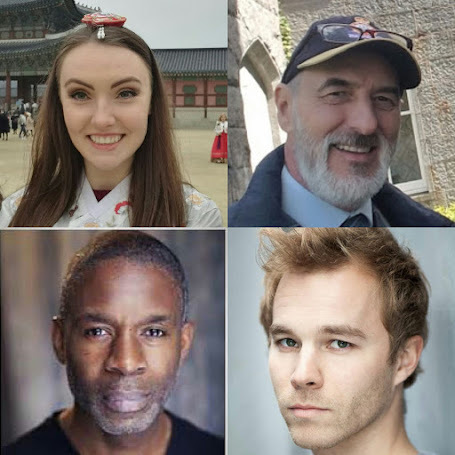 One of them expresses regret at turning Jamie down, but cites his recent employment at the cooper’s shop and muses that it would be unwise to leave. Ian is confused too. “Did six farmers just refuse the offer of land - and without charge?” he asks. Jamie goes over to the bar to try and convince the regretful man. Discovering the man’s name is Brian, Jamie says that was his father’s name, asking the man if he has heard of Broch Tuarach. 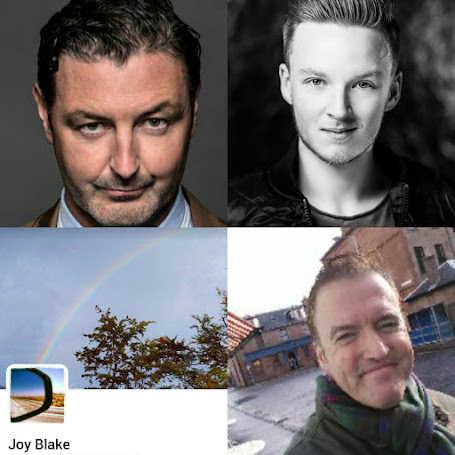 But Brian is from Banffshire, agreeing withJamie’s compliment that it is a bonny place. 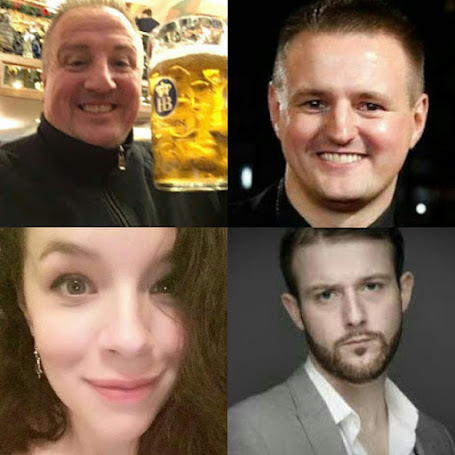 Jamie tries again: was Brian imprisoned? “Tilbury Fort” the man replies, adding that he fought with Farquarson’s regiment. “Then you were to my left, Brian,” Jamie replies. 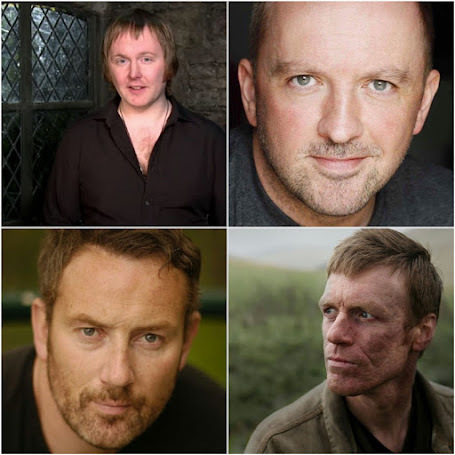 The memories of Culloden pass between the two men and Brian again expresses regret at refusing Jamie’s offer. Jamie asks why he is doing so and Brian explains. Men have cultivated lands before, he tells Jamie, only to have it taxed when it became plentiful. Jamie comments that everyone must pay taxes, but Brian explains that the taxes have not been fair. Tax collectors had come repeatedly, and when the men didn’t have the funds to pay, they had their stock and tools seized. In the end, they gave up their farms and moved to the town, rather than continue to line the pockets of Governor Tryon’s dishonest tax collectors. Now, Jamie realises the enormity of the task ahead of him. There is no love for Tryon amongst the Scots here in the town and even though he intends to be fair to his tenants, he does not have the reputation that he did in Scotland. No one will agree to settle with James Fraser on the strength of his word. But Brian makes one last offer, saying “There’s a meeting soon. 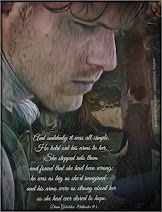 If you’re interested.” It is the only way that Jamie will understand the feelings of the men. Herr Mueller has arrived home, along with his son, Tommy, both anxious to meet the baby. Mueller thanks Claire, who tells him that she will return in a couple of weeks to check on the baby, but reminding him to send for her should he need anything. Before she leaves, Claire is told the baby’s name. The little girl is to be named Klara, after her. She tells them how honoured she is and thanks them profusely, while Herr Mueller unwraps a little doll from a piece of cloth and hands it to his daughter for the baby. The happy family scene is interrupted by Rollo’s barking and baby Klara begins to cry. The mood changes abruptly, Herr Mueller grabbing his rifle. The savages are outside, he says, stealing the family’s water for the horses. The women start to pray, as Claire looks through the window. It is the Cherokee, who are indeed watering their horses at the creek. Claire tries to reason with Herr Mueller, but he is angry, heading outside to confront the Indians. 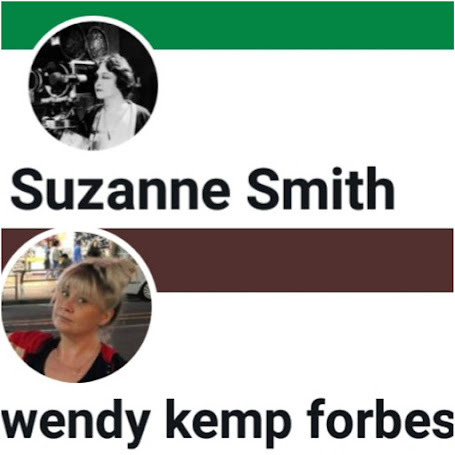 She follows, trying desperately to keep the peace. Mueller aims his rifle; the Cherokee their rifles, bows and arrows. Claire calls out to Tawodi, introducing herself and telling the men that she is a healer like Adawehi. Tawodi recognises her, addressing her as “wife of Bear Killer” and expresses surprise that she should be at the Mueller’s house. Claire explains that she came to deliver a baby and that the Muellers are good people, only trying to protect their land. “Water belongs to everyone,” Tawodi responds. Claire agrees, but adds that Herr Mueller doesn’t see it that way. She begs Tawodi to take the horses to another part of the creek, in order to keep the peace. He agrees, but only because of Claire’s friendship with Adawehi. Claire thanks them and they leave, Tawodi sprinkling some powder on the ground before he goes. Mueller is immediately suspicious and raises his rifle again, asking what the Cherokee man is doing. Claire explains it is a blessing for the water. It has been a tense standoff and a reminder of the unrest all around them. Claire and Rollo arrive back at Fraser’s Ridge. Claire is relieved to be home, collapsing gratefully on the bed. A montage of domestic scenes begins: with Claire feeding the livestock and talking to the animals, preparing herb bags, knitting and cooking stew. That evening she notices that one of the candlesticks is missing. The routine begins again the next morning, with the addition of Claire having a dram of whisky. The overall effect is to create the impression of Claire Fraser: frontier woman - and it works. Claire is becoming as adept at farming life as she is with a scalpel in her hand. Jamie and Ian have given up and are heading home. Ian asks if Tryon will demand the return of the land if they can’t find settlers and Jamie responds that he will have no choice: he can hardly afford to pay the taxes on ten thousand acres by himself. What he can do, he says, is to offer protection for his tenants, guarding against unfair taxes and the seizing of their land. 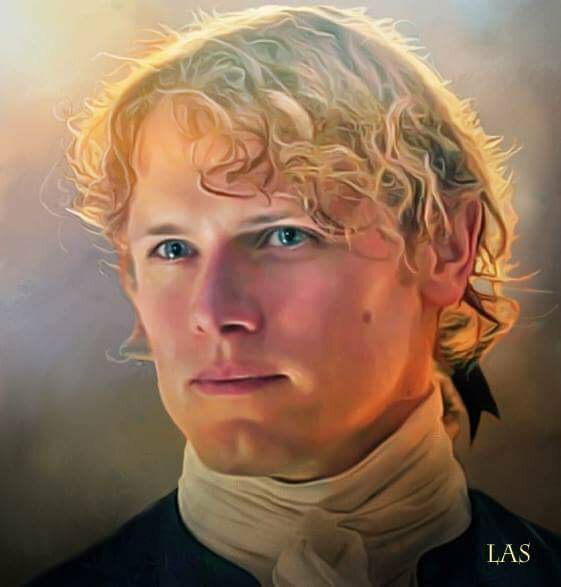 The tax collectors would come to Jamie first and when they do, he will only agree to pay a fair tax, nothing more. Just as they ready to depart, Ian notices that the horse’s bit has broken. It needs to be fixed before they can travel, so Jamie tasks Ian with the job, handing him a purse of coins,while he calls on the silversmith MacNeill one last time. The sign says “Barker’s Smithy” and the white haired blacksmith faces away from Ian as he approaches. Gruffly, the man refuses Ian before he can even explain what he needs, telling the young man that the day is done. Viewers immediately recognise the voice: at last, here is Murtagh Fitzgibbons Fraser in the flesh! 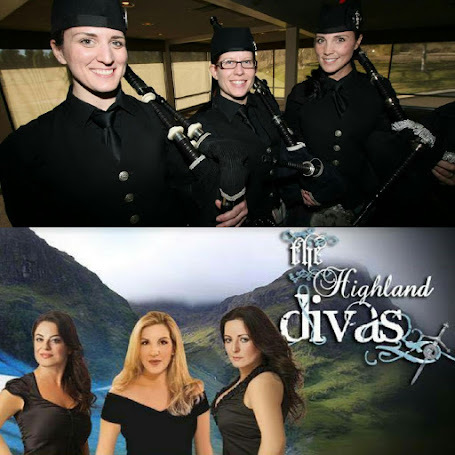 Ian tries again: will the blacksmith make an exception for a fellow Scot? “I’d be here all night by that logic,” he replies. But Ian isn’t giving up. They have 3 days’ travel ahead, he says and his uncle will have his guts for garters if he doesn’t get the bit mended. He asks what it will cost for an extra hour of the blacksmith’s time, offering first 10, then 11, then 12 shillings. It is an exorbitant amount and both know it. But Ian hands over the money, and the job is done. Meantime, Mrs MacNeill tries one last time to seduce Jamie, telling him that her husband is still away, but if he’d like to come in, she’ll serve him a hearty piece of pie. The double meaning is not lost on Jamie. 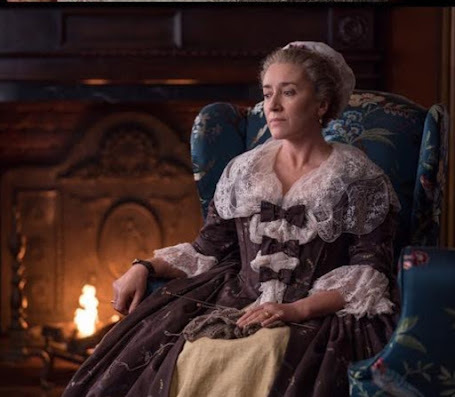 He tells the woman that his wife is expecting him home and when she muses that Claire must be a good cook, he replies with one word: “Very.” It is an amusing little by-play, but Jamie’s quest to have the candlestick made into what can only be a replacement ring for Claire has been thwarted. 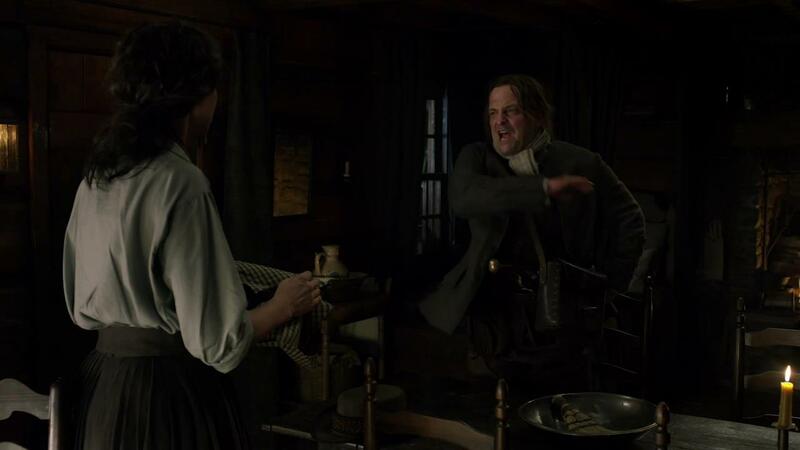 Murtagh is working the bellows when Jamie storms in to the smithy. “What the devil’s the meaning of charging a lad twenty one shillings for a bit?” he yells. We see the recognition on the older man’s face as he hears Jamie’s voice. Slowly he turns and Jamie’s eyes widen in shock. 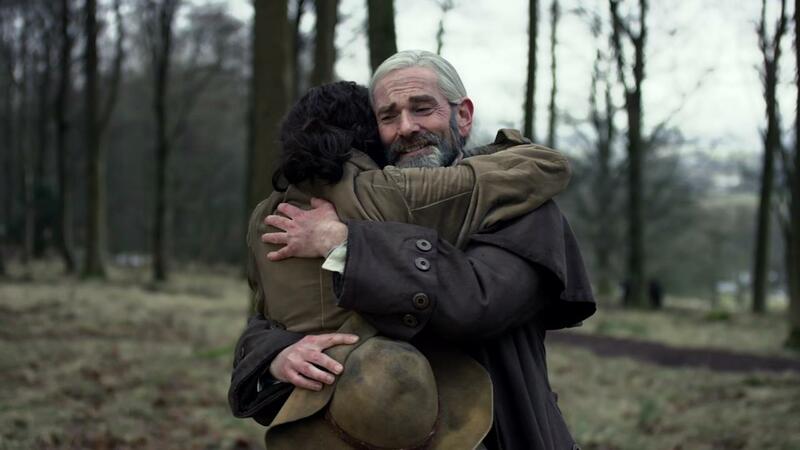 Each whispers the other’s name, before Murtagh walks forward and grabs Jamie in a huge bear hug. Ian is confused. “Do you ken this old coot?” he asks Jamie and Jamie nods, tears shining in his eyes. 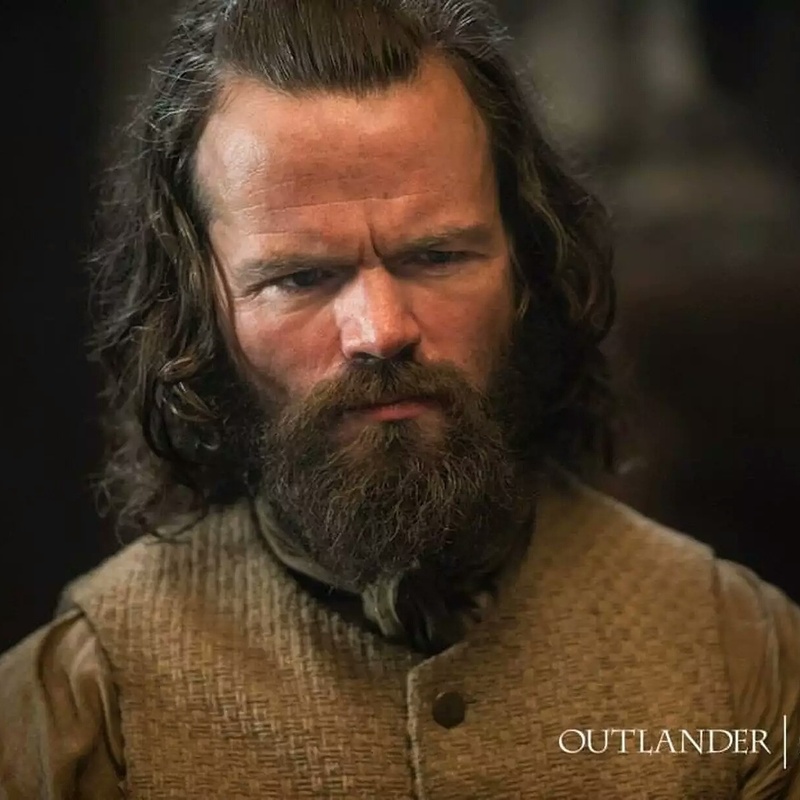 Murtagh says that he never thought he would lay eyes on Jamie again, asking what has brought him to Woolams Creek. Jamie explains that he has land three days north of the town and has come in search of settlers. 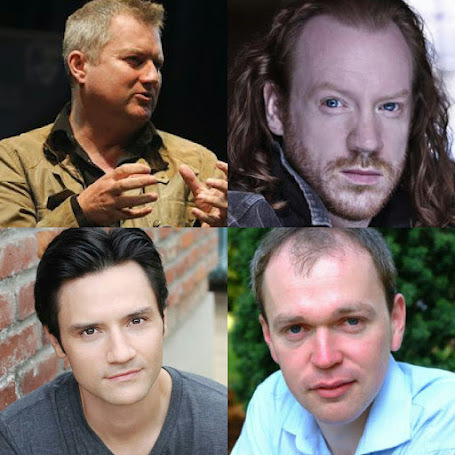 He introduces Ian, who tells Murtagh that he has heard all about Jamie and Murtagh’s adventures together. “There’s so much to tell you,” Jamie says. Back at Fraser’s Ridge, Claire is performing her ‘feeding the animals’ routine when a pounding at the cabin door startles her. She goes to investigate and finds Pastor Gottfried, who has brought grim news from the Mueller’s cabin. Petronella, Tommy and the baby have all died from measles and Herr Mueller has lost his mind. The Pastor has come with a warning. 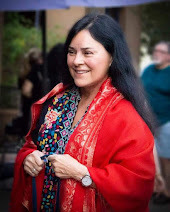 Frau Mueller is afraid that her husband blames Claire for their deaths and is seeking revenge, believing that Claire let the Indians curse their water. Claire remarks that she told Mueller that Tawodi’s gesture was a blessing, but the Pastor echoes her earlier statement: “He doesn’t see it that way.” He tells Claire that she can’t stay at the cabin and must go somewhere safe, but Claire is adamant that she is going nowhere. Jamie will be home soon, she tells him, and she has a rifle. The Pastor reluctantly agrees, calling “God be with you” as he leaves. Rattled, Claire goes inside and loads the rifle. Murtagh is telling his story to Jamie, filling in the years since they were together at Ardsmuir. He was an indentured man for twelve years, he says, to a violent blacksmith named Barker. More than once, he had thought of retaliating, but when the man finally died, his widow offered to sell the smithy to Murtagh. By this time, Murtagh says, he had mastered all forms of smithering. This gets Jamie’s attention and he takes the candlestick from his bag. Murtagh recognises it at once. “This was Ellen’s, no?” he says. “A surprise for his wife,” Ian adds. When Murtagh asked Jamie if he married again, Jamie sends Ian to the bar for more ale, after Murtagh returns the purse from earlier. 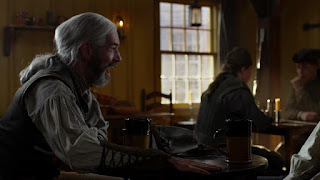 With Ian out of earshot, Jamie tells Murtagh that Claire returned, and Murtagh pounds the table with joy. He asks about the baby, Jamie replying that their daughter Brianna is alive and well, living in Boston in 1971. 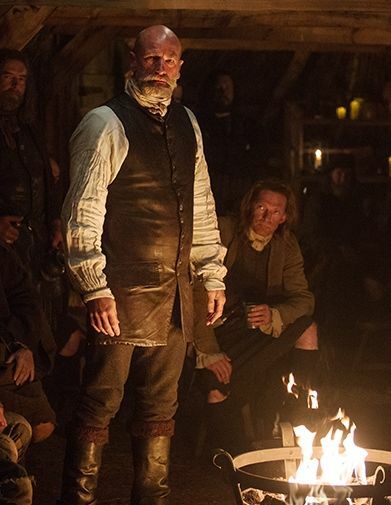 Jamie asks if Murtagh will return to the ridge with them, offering to build a forge, adding that with ten thousand acres they will need a blacksmith. But Murtagh does the unthinkable: he refuses. He says he has work to do in Woolam’s Creek, important work. 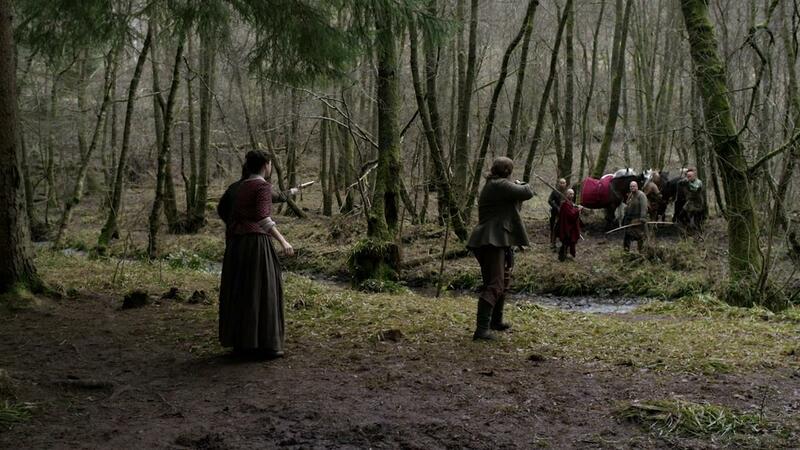 Instead, he tells Jamie to go with him to the forge. He will do the silversmithing, but is then going to take Jamie to a meeting. Suddenly it dawns: Murtagh is a regulator. 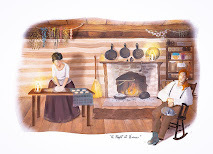 Back at the cabin, we get another glimpse of true ‘frontier woman Claire’ - sitting by the fire, rifle on her lap, tearing at a piece of beef jerky, as she restlessly keeps guard in case Herr Mueller should appear. Rollo is nervous too, barking at every noise, which at this stage, is nothing more than the wind. The meeting of the regulators is beginning. Jamie and Ian are eyed with suspicion as they enter. Murtagh murmurs that he will find them later, and stops to greet Brian, with whom Jamie had spoken earlier. 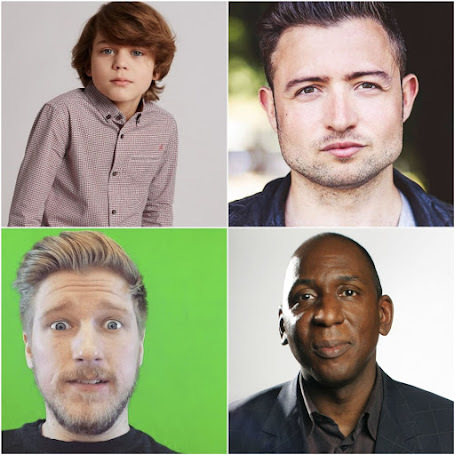 Indeed, all of the men who refused Jamie are here. 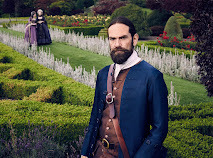 It is unusual for Jamie to have no influence over others, but this is Murtagh’s show. He calls for silence, as he instructs everyone present to drink to the tax collectors. There is confusion at first, until the group realise that Murtagh is telling them to wish their tax collector and sheriff a fine supper, a good bottle and a soft bed, because it will only be the calm before the storm. He leads a rallying cry, promising that soon the tax collectors will have no peace. “The day is coming”, he says, the day when they make plain their complaints and stand for what’s right. They will only pay what is fair, standing together against the corruption. “You’ll need your courage,” Murtagh tells the impassioned crowd, “a rifle of two couldn’t hurt neither, for the time is coming when we will march!” The group erupts in cheers and you can’t help but see the similarities here with Dougal in season 1, inciting the crowd into a frenzy against the English and to join the Jacobite cause. But instead of Jamie’s scarred back to spur him on, Murtagh has his piece of Ardsmuir tartan pinned to his chest. The meeting ends with men pledging themselves to the cause by signing their name. Jamie and Ian approach Murtagh, Jamie saying, “So, you’re a regulator then” and Ian observing that not only that, but the leader of them. Murtagh disagrees, saying he is only an old man who has been through it all before. 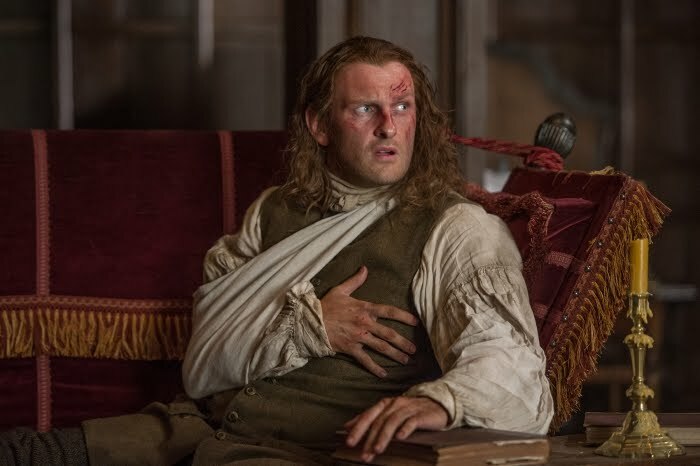 He urges Jamie to join them, but Jamie provides a word of caution. He tells Murtagh that a gathering of such a size could well become violent. Murtagh is under no illusion that Jamie is right, but merely smiles and tells his godson that he risks what he must for his beliefs. But Jamie has Claire and Young Ian to think of, he says. “And the land,” Murtagh observes. This is true too. The land came with the proviso that Jamie would help to quell any unrest. He gave his word, he tells Murtagh, and can’t in good conscience, involve himself with the regulators’ cause. But neither will he try to stop them. “I pray one day you’ll come find us,” he tells Murtagh and there is sadness on both their faces. This is a big deal. 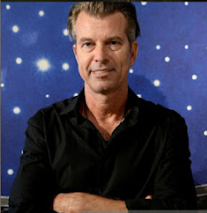 A show-only storyline is taking front and centre, and it is one that will apparently have repercussions well into the next season. 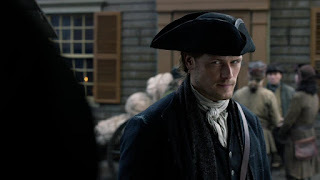 Just what these will be is anybody’s guess at this point, but it is no small matter to have Jamie and Murtagh on opposing sides of a conflict, when they have always fought by each other’s side. 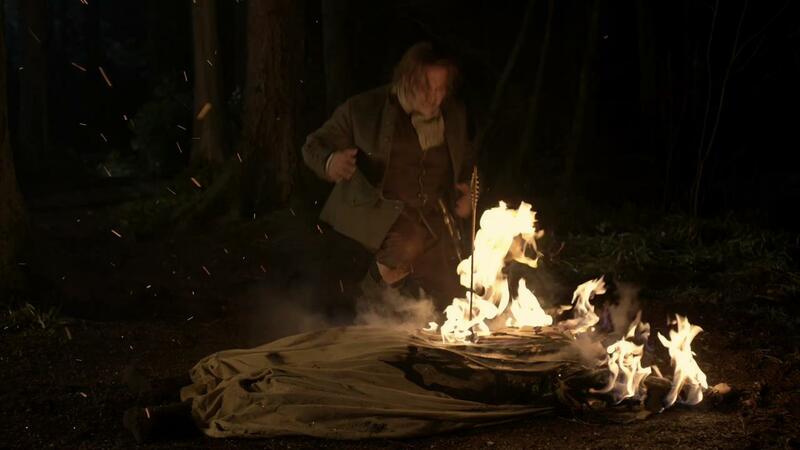 Of course, none of this action happens in the book, given that Murtagh died at Culloden, so it will be fascinating to see where this original storyline goes and whether or not it overlaps with plot points from the original books. 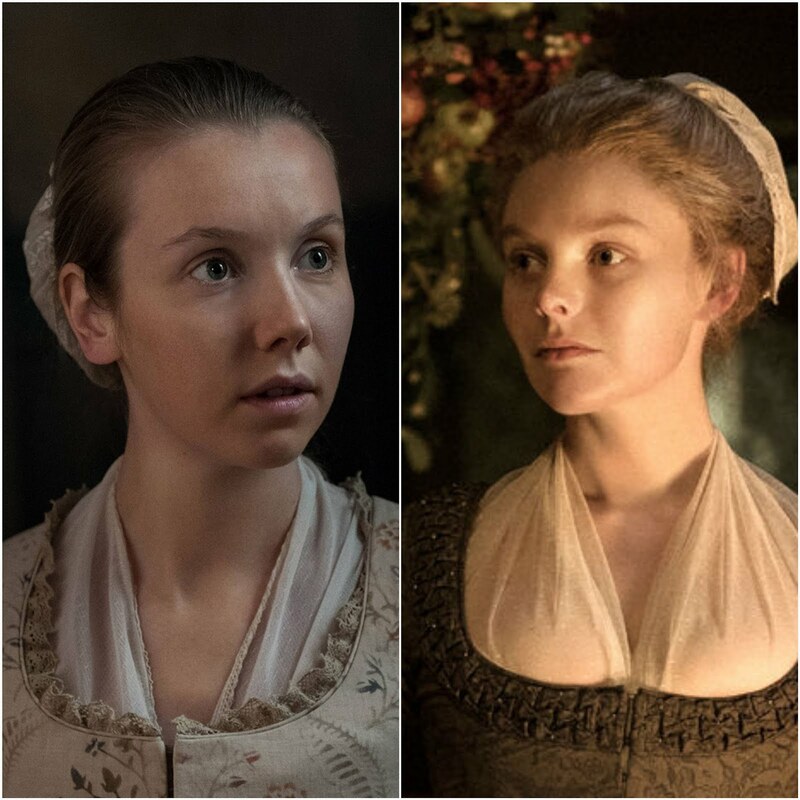 This is certainly not the first time that changes have been made (the reappearance of Laoghaire in season 2 comes to mind, as does the Randall family life from 1948 onwards) but previous changes have still seemed connected to the source material. This is different, in that there can be no book kernels in this storyline, given Murtagh’s demise on the page. It also puts to rest the popular fan theory that Murtagh would replace the character of Duncan Innes at River Run. 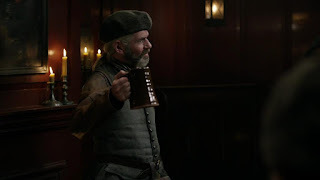 Murtagh has his own post Culloden back story now, and has evolved past being the man at Jamie’s side to being a leader in his own right - and possibly a violent one at that, who could find himself coming into direct conflict with the man that he had sworn to protect. We can only stay tuned and watch with interest! 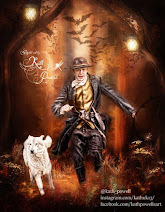 A sleeping Claire is woken again by Rollo’s barking and this time it is indeed Herr Mueller who is outside the cabin. 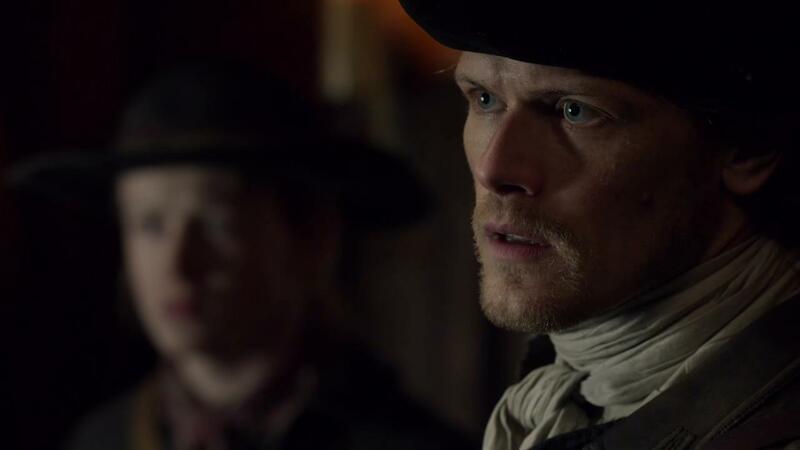 Aiming the rifle at the door, Claire asks what he wants. But far from threatening her, Mueller seems genuinely concerned. He tells Claire that he has been worried that the measles would take her too. Her voice shaking, Claire thanks him for his concern and assures him that she is well. But Herr Mueller is grieving. “They are dead,” he says,sitting down at the table. 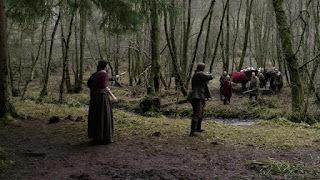 Claire lowers the rifle and approaches him, expressing her regret that there was nothing she could have done. Mueller tells her that the curse had been strong and that they had died very fast. Claire tries to explain that measles is a disease that spreads from person to person and that the disease probably travelled with him from Cross Creek. But Mueller will not accept this explanation. He and his wife had both had measles before and had merely been sick for a week. Everyone had died too quickly, he says. Claire tries again. Their bodies would have been weak after the birth, she tells him and would never have survived the fever. But Mueller is becoming more agitated. He is convinced that his family have died from a curse, telling Claire that the savages hate them and want their land. The Indians should die from the pox, he says, not a Christian family who believes in God. But then he shakes his head in resignation. It is over now, he says. He has taken care of them, for his family and for Claire. He hands a wrapped object to her. Believing it to be the doll that he had brought from Cross Creek for the baby, Claire takes the cloth and thanks him. 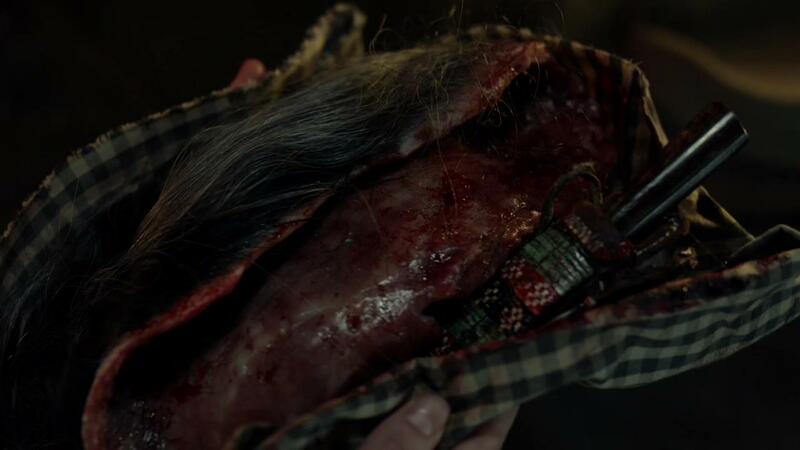 But on unwrapping it, Claire is horrified to see a scalp, with Adawehi’s hair and beaded jewellery still attached. “Adawehi,” she whispers and looks desperately at Mueller. “She was a healer,” she says. Her anger rising, Claire tells Mueller that all the Indians had wanted was some water. He yells in response that water is everywhere: the creek, the lake, the stream. He does not believe that they came to his land for water. They are savages, he screams, come to show that his land is theirs. Claire’s eyes fill with tears and she stares back at him. “Goodbye, Herr Mueller,” she says firmly. After a beat, he returns the farewell and leaves the cabin. It is Claire’s turn to grieve. Wrapping Adawehi’s scalp in her own cloth, with the herbs they had gathered together “for the mother”, Claire puts the cloth into a wooden box that she then places ceremonially into the fire, watching as the flames take hold. Other flames are also being lit. Flaming torches are shot through the air, landing in another cabin and setting it alight. The door of the Mueller’s cabin opens and Frau Mueller staggers out. She has been shot by one of the arrows. As she pitches forward into the dirt, the flames take hold of her body. Herr Mueller arrives home in time to see this. He races towards his wife but he is too late. Another arrow shoots him in the chest and he falls. The rest of the cabin catches alight and the Cherokee watch as it burns. They ride away, and the last image we see is that of baby Klara’s doll, also succumbing to the flames. Jamie asks what is wrong, but she merely asks him to hold her, which he does. 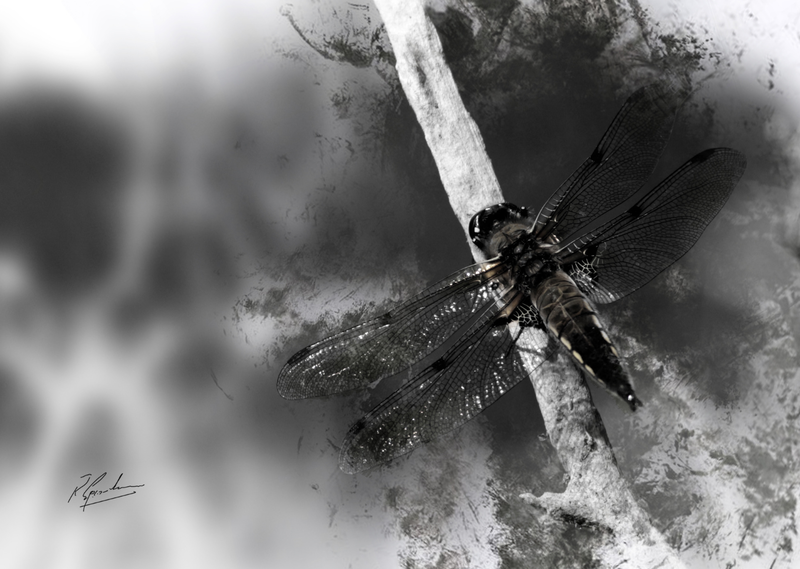 Some time has passed and a calmer Claire is gathering logs for the fire when she hears a familiar whistle. 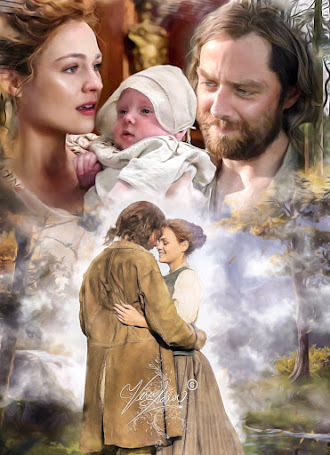 It is the song that she had sung back in season 1, when she and Murtagh had been searching for Jamie. Disbelieving, she turns. It is indeed Murtagh, who strikes a pose with a chuckle. It is a beautiful reunion. “Is it really you?” Claire asks. “Well, it’s not the boogie woogie bugle boy,” he responds and the two embrace warmly, before heading into the cabin. The final scene begins in a familiar place, with a familiar haunting tune. 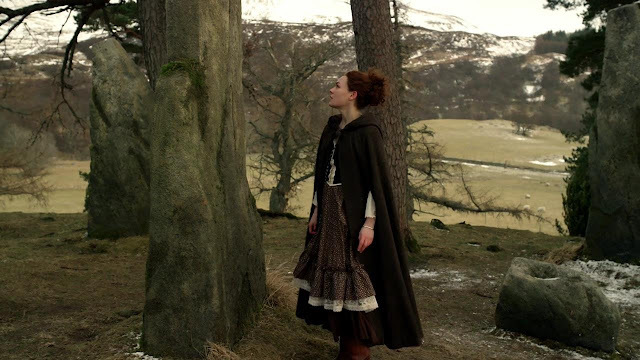 We are back at Craigh na Dun, but it is Brianna’s voiceover that we hear, as she reads the letter that Miss Baird has handed over in an earlier scene. 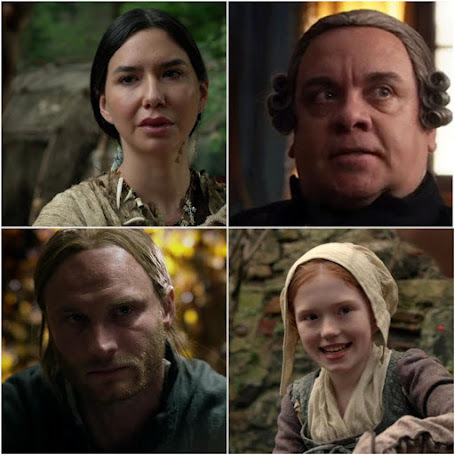 Bree tells Roger that she has found out that something terrible is going to happen to Claire and Jamie and that she would never forgive herself if she didn’t try to help them. The scene cuts between Brianna standing in front of the central stone and Roger’s reactions as he reads the letter sitting at the fountain. We see the emotion clearly on his face as Brianna tells him that cared about him very much and asks him not to follow her. She reminds him that he had told her that she should think of her mother living happily in the past. Now, she wants Roger to think the same way about her. 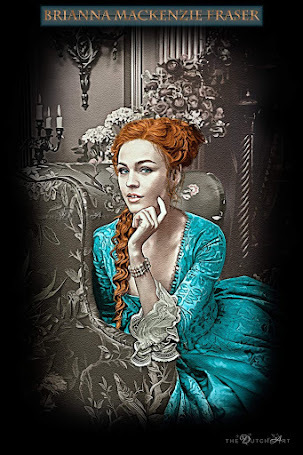 With one final look around, Brianna, dressed in an approximation of 18th century garb and touching Roger’s silver bracelet for courage, walks up and touches the stone as a light breeze blows. The camera pans around - and she has gone. 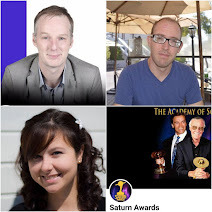 This episode recap was written by Susie Brown, a writer and teacher-librarian who lives in Australia. 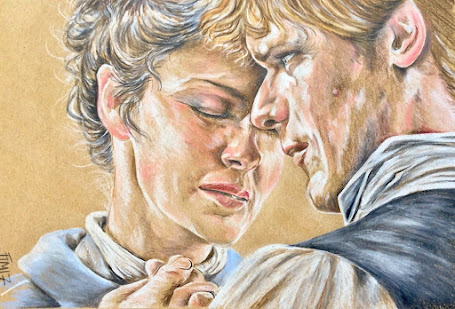 She knows it’s a total departure from the books, but she loved the reintroduction of Murtagh and may have shed a tear or two as he was reunited with Jamie and Claire - and she can’t wait to see where his storyline leads.